Okay – I finally got the heck out of the station for something other than my daily trek out to Summer Camp (or sledding, or XC skiing out to The End of the World or the like). 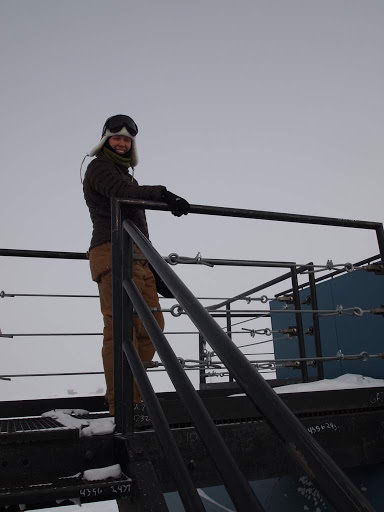 Today, I got to visit ARO – the Atmospheric Research Observatory! Like most of the projects here at the Pole, you’re not supposed to just wander in, so I’d checked with Christine when/whether it would be okay to visit some day after I got off duty (“Please, please, please?”). She said today would be fine (“Heck yeah!”), so I made the trek out to the edge of the clean air sector, a quarter mile to the Northeast. The weather’s turned sour again, so I got to actually make my way through drifting snow. Christine – or more properly Lt. (jg) Christine Schultz (the NOAA Commissioned Corps use ranks paralleling those of the Coast Guard) – met me at the top of the stairs and showed me into the Blue Cube. We’ve got some DVs (“Distinguished Visitors”) from the NSF coming in a couple of days, so I got to play test audience for the nickel tour she’s supposed to give them. We started out with charts showing some scary trends in atmospheric monitoring – CO2 steadily rising worldwide – and some not-so-scary trends – the chlorofluorocarbons that were eating the ozone layer peaking and starting down as CFCs were phased out. 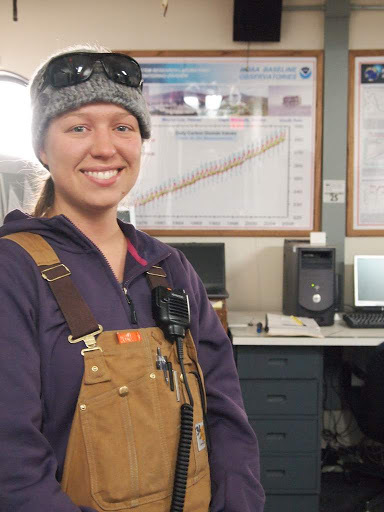 This ARO is part of a chain of AROs stretching all the way up to Barrow, Alaska, where they measure atmospheric CO2, ozone, CFCs, molecular carbon and a bazillion other things in the air. 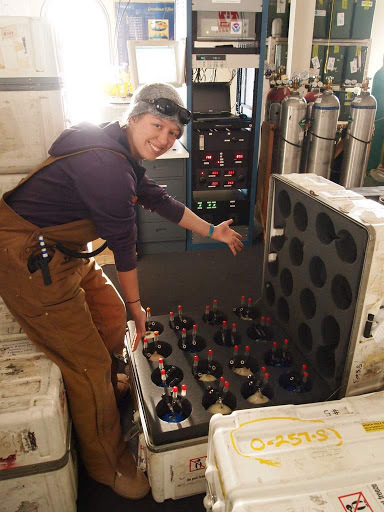 Many of the measurements are done on-site, but they also gather air samples in pressurized glass jars (expensive glass jars – C told me they cost something like $500 each!) that they send to Headquarters in Boulder for more detailed analysis. The blinking lights, whirring machines and brass tubing are great fun, but the real treat is going upstairs where the “business end” of the instruments are. The roof is covered with all sorts of sun-tracking and sun-avoiding cameras, as well as the “sampling tower” where they get their “local” air. A few hundred meters away is an even larger tower where they sample the air at three or four elevations up to about 30 meters. 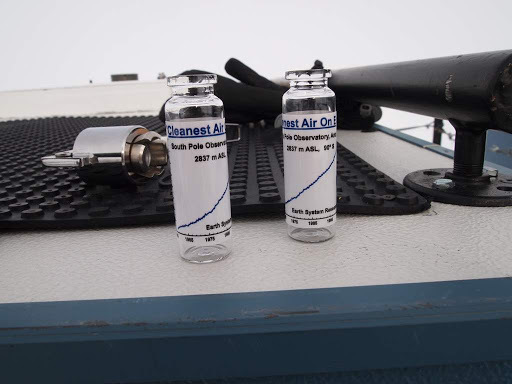 One of the highlights of a field trip to the ARO is the souvenirs: a dated, bottled sample of the cleanest air on Earth. Christine grabbed a couple of empty sample jars (little ones, not the expensive $500 ones!) and waved them into the wind on the ARO roof before crimping tops on them for me to take home. So – that was my field trip. More pictures over at http://picasaweb.google.com/david.cohn/2010-12-06-aro. I still need to visit MAPO, the South Pole Telescope, Ice Cube and the other “Big Science” projects down here, but those’ll have to wait a bit.